Watford have dropped not one but two simultaneous announcebombs this afternoon, beginning with the news that Gerard Deulofeu has signed a permanent deal with the club. Deulofeu has signed a five-year contract at Vicarage Road after spending last season on loan from Barcelona. The transfer fee is reported to be somewhere around the £13million mark. 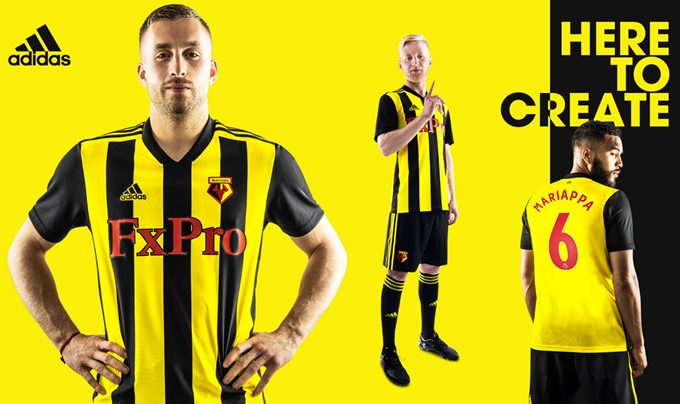 As for that kit, while it doesn’t look like a Watford strip per se, we kind of like it… begrudgingly… -ish. It’s the very first time that the club have played in full vertical yellow and black stripes in their 137-year history, with 2015/16’s horizontal ‘Venetian blinds’ design the closest they’ve ever come. Obviously, the kit purist is us would prefer to see Watford in red shorts, but you can’t have everything.